Rabelo has been a very naughty girl. Her pilothouse broke… again. The first time it was one of the eight steel cables that lift the pilot house roof. With some help from my friend Bruce I managed to replace the broken cable. This time it was a weld on some rollers that the cables run through. Unfortunately I don’t know how to weld, but I’m seriously thinking of learning. Fortunately, Kevin our old captain does know how to weld, but we’ll have to wait a week before he can make the necessary repairs. 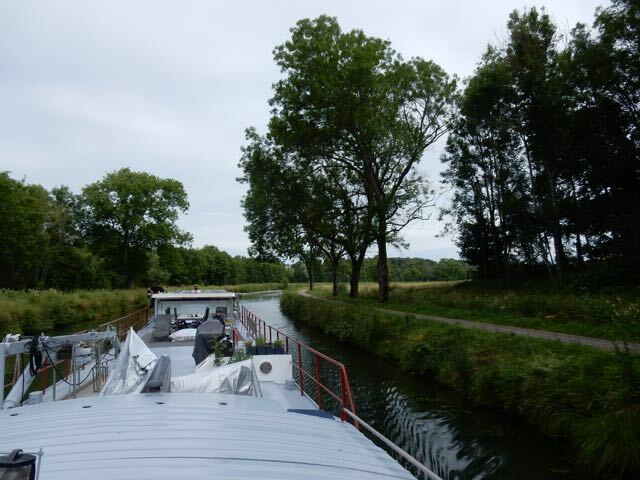 Once again I managed to lower the pilothouse all the way down so that we could continue our cruise to Langres. I also called the pilothouse manufacturer and asked them to come out and inspect the entire lifting system. They are in Holland, so it will take a couple of weeks before we will see them. We kept on cruising with Rabelo’s pilothouse permanently lowered. No noise, traffic, or tourists. 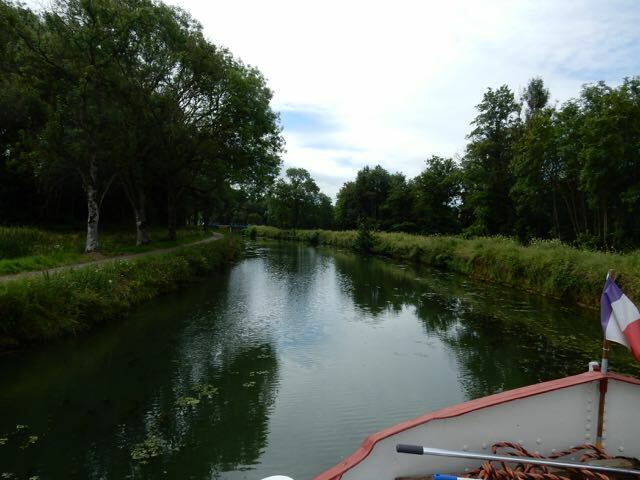 Just a beautiful canal. We’ve been to Langres a number of times, and have always enjoyed our visits. Langres is located on a hill top promontory that looks over the Marne Valley. It has the longest ramparts in France at 3.5 kilometers. These oversized medieval walls make for an easy walk around the city that includes great views. 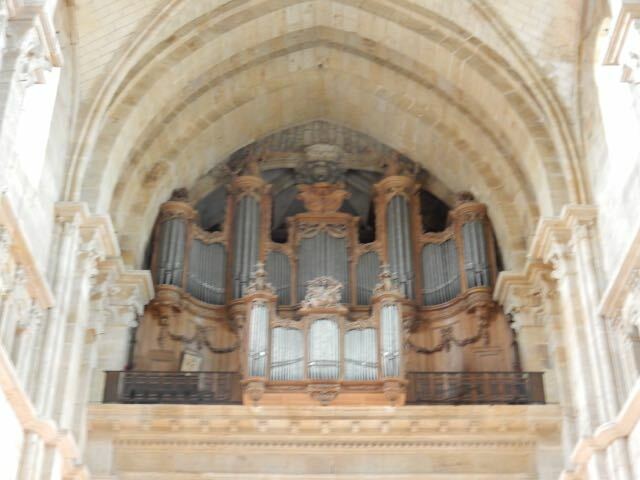 There is also an impressive cathedral with an organ that has 4071 pipes. 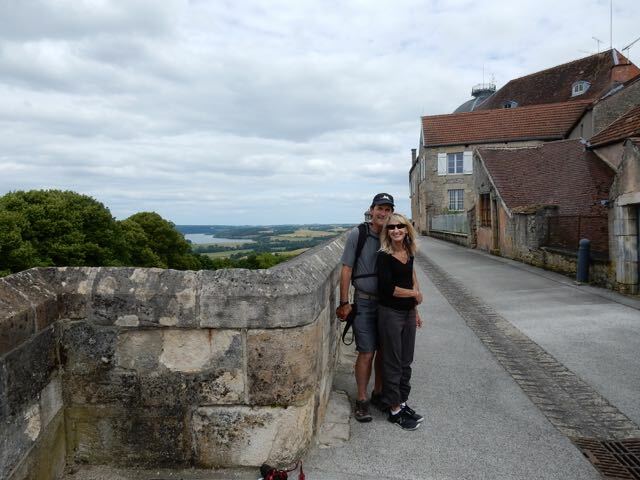 Our friends Bruce and Tess on the Langres ramparts. Now that’s what I call a pipe organ. The cathedral with its beautiful Burgundian roof. The Navarre tower is part of the ramparts that surround Langres. Construction began in 1512, but in August of 1515 the governor of Champagne decide the tower need to be 2.5 meters higher. I have no idea why he decided to raise it, and neither does anyone else. 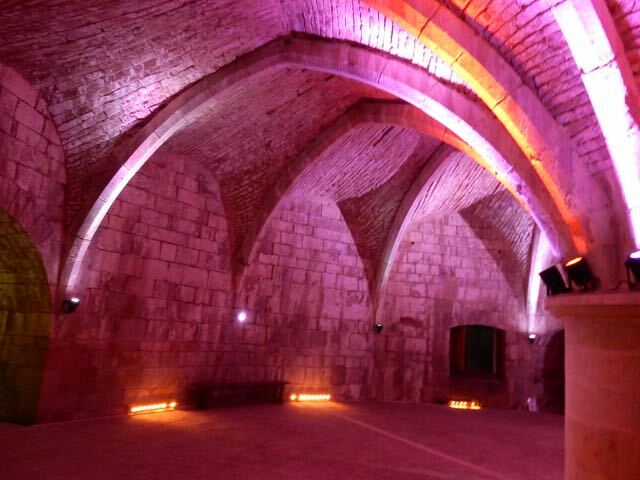 After demolishing the vaulted ceiling on the second level they realized that the artillery terrace would not be at the same height as the walkways on the ramparts. Without the ability to get cannons and munitions to the artillery terrace they decided to build a second tower called the Orval tower. Within the new tower they had to incorporate a spiral ramp to move the cannons and munitions to the higher terrace. The Oraval tower walls are up to seven meters thick. That’s 23 feet, and just like the Governor of Champagne ordered they’re 2.5 meters higher than the old towers. The lower level of the Orval tower. 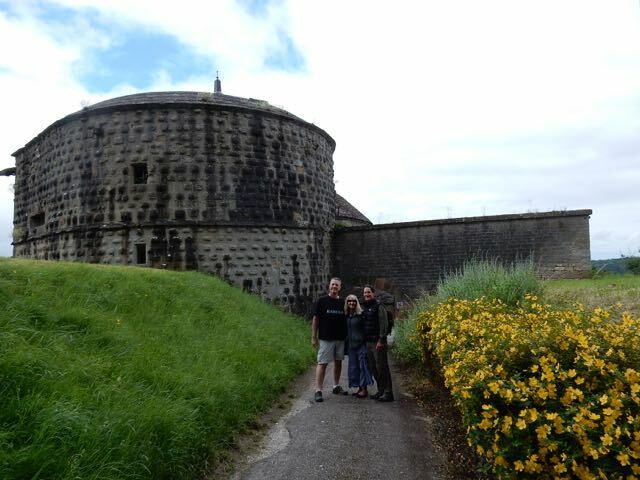 The Navarre tower with friends Bruce and Tess. 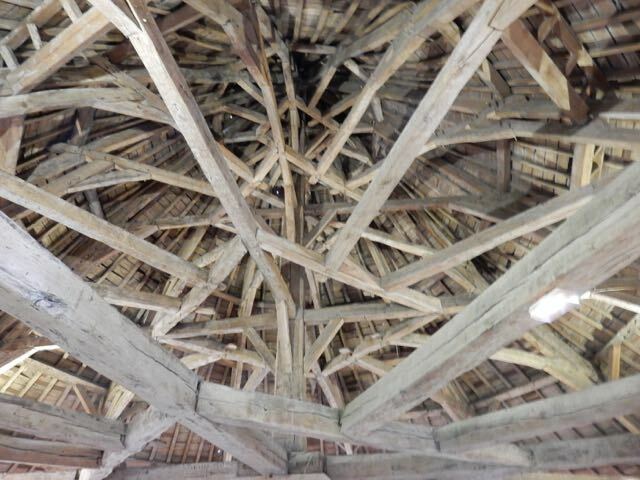 The roof of the Navarre tower held up with 500 year old oak timbers. We decided to take Tess and Bruce to Dijon. It is one of our favorite cities in France, but it wasn’t always that way. It took some time to learn our way around and appreciate all the sites and activities there are to enjoy. The first place we had to take them was the famous lucky chicken. It’s actually an owl carved into the side of a church, but it looks like a chicken to me. Supposedly when you touch the chicken it brings you good luck, or so they say. 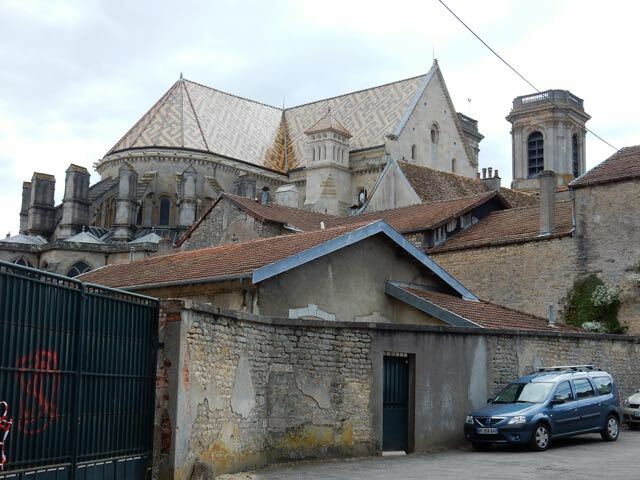 We were walking down one of the smaller side streets in Dijon, and found a small museum that at one time was a church. We decided to check it out, and the first thing we came upon was one of the most amazing bas-relief sculptures I’ve ever seen. It was yuuuge! 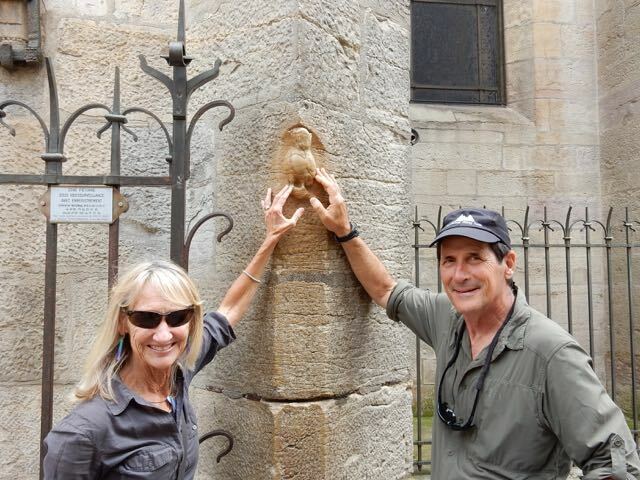 Bruce and Tess touching the lucky Dijon chicken/owl. Is this the most amazing sculpture? 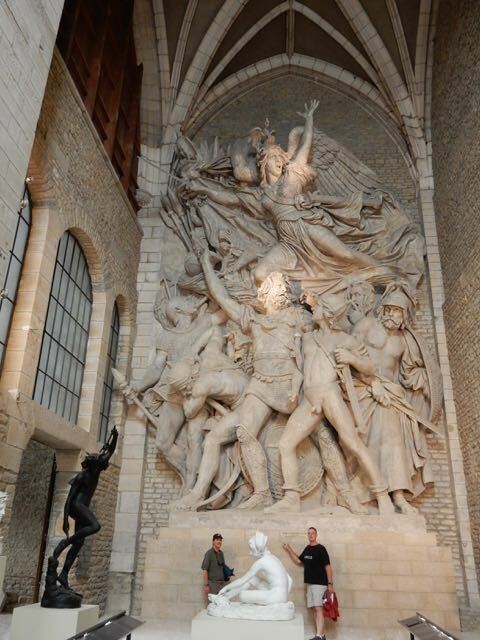 If my notes are correct it is at the Saint-Etienne church which is now a museum. 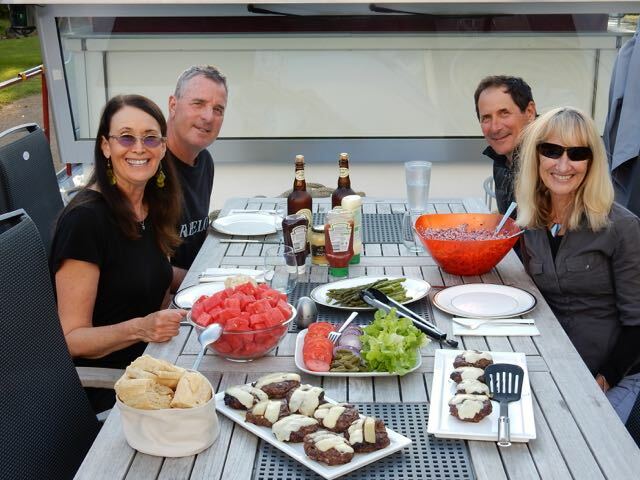 Celebrating the 4th of July on Rabelo. The only thing missing were the hamburger buns. Note the sliced baguette in the white bread basket. 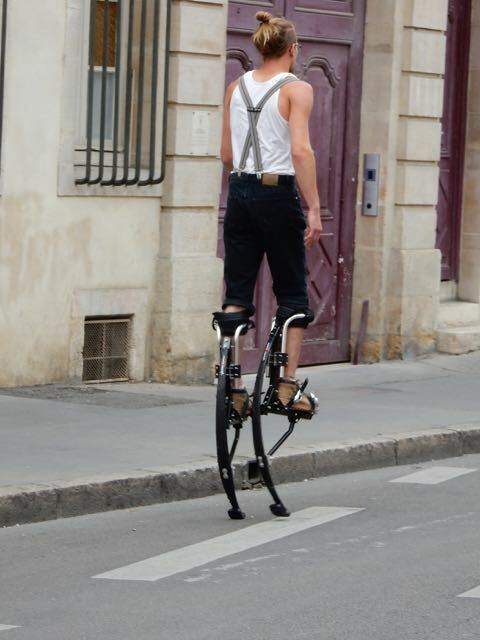 Some pretty fancy stilts on the street of Dijon. Our next stop was the Jardin de Silliere. 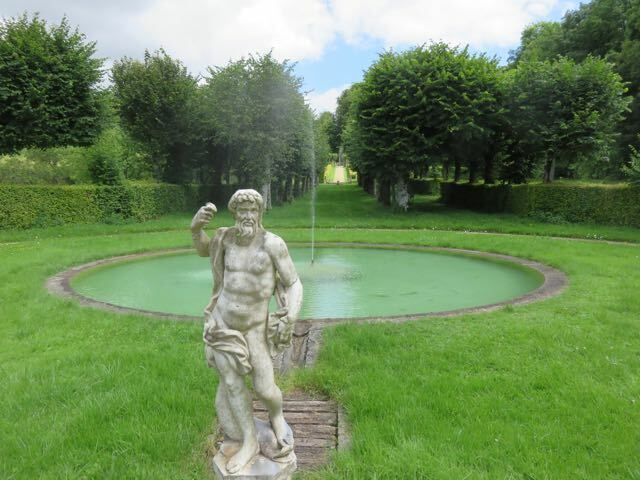 It was not as well maintained as some of the public gardens we’ve visited, but the owner gave us a private tour. Hearing the story about his family and how they acquired the property was as enjoyable as the tour. The fountains, and waterfalls are all gravity fed. We were lucky there was so much rain in the spring. Normally by this time of year everything was dry. 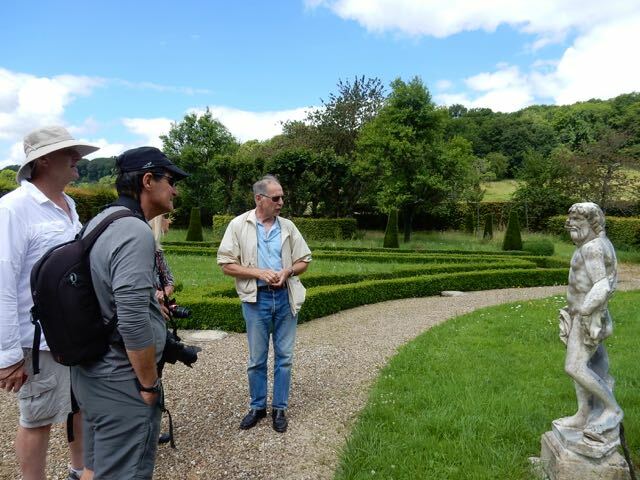 Our tour guide for the Jardin de Silliere. One of the gravity fed fountains. Bruce and I ran an errand in the car. When we returned this is what we saw. I almost went into cardiac arrest. 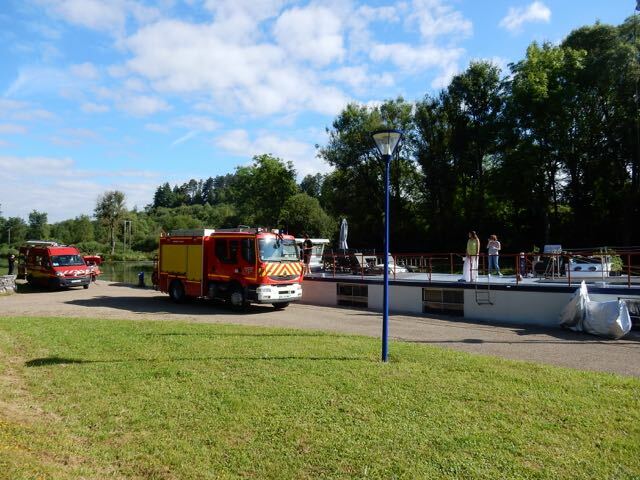 Fortunately it was an training exercise, and had nothing to do with Rabelo or our guests.